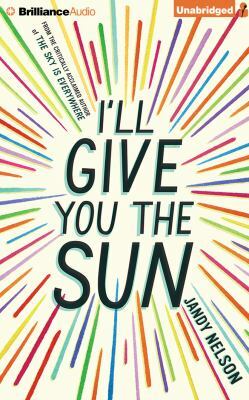 Posted on March 25, 2015	by Katy K.
I’ll Give You the Sun by Jandy Nelson. Performed by Julia Whelan and Jesse Bernstein. Brilliance Audio, 2014. Jude (a girl) and Noah (a boy) are twins whose relationship seesaws between devotion and rivalry. Noah introduces us to them in middle school, when Jude is wearing short skirts, bright red lipstick, and unenthusiastic about their mother’s plan for them both to get into CSA, a local art high school with a national reputation. Noah is long-haired, not really popular in school, but open about his art and doing everything he can to get into CSA. The two are each other’s best friends. The chapters alternate between Noah telling the story of middle school and Jude telling their story starting three years later, when everything has changed. Their mother is dead; Jude is at CSA wearing baggy clothes and keeping everyone shut out while Noah is at the public high school with short, short hair and pretending to be straight. Now Noah is the popular one, with crowds of people around him, and Jude is on her own. They are not talking to each other. Neither Noah in the past nor Jude in the future knows exactly what happened to their relationship, and it’s the journey of the book to figure it out and try to put it back together again. Noah knows from the get-go that he’s gay, but isn’t sure that his father will accept it. His slow romance with the baseball-playing, astronomy-loving boy across the street was so beautiful it hurt. In between the two narratives is a host of complicated things that the characters have to work through. Just where was their mother going on the day she died, and what put her in such a state that she drove off the road? There’s lots going on with the characters, both of them needing to get to know themselves and each other better, both working towards hard-earned romance. Grandma Sweetwine’s ghost appears rather frequently to give Jude not always welcome advice. The supporting characters are wonderful as well, including a slightly crazy English art model and the middle-aged sculptor Jude wants to be her mentor. I don’t want to spoil it by telling too much – but this was one where I kept finding myself wanting to drive a little farther just so I could find out what happened next, wondering how things would work out as I was falling asleep at night. Yes, there’s a lot of sadness, but also the effects of truth and lies, forgiveness and love. As is only right for such a book, Noah and Jude have separate narrators. Jesse Bernstein is excellent as always at a young male voice, while Julia Whelan gives Jude an assured, lower-pitched voice that sounds just right. I have to agree with the PW review that her Spanish accent – wasn’t really quite – but otherwise, both performances were spot-on. This is the kind of audiobook that takes an already great story and makes it even better, bringing the characters to life and sucking the listener into their world. It’s one that pulled my heart right out, just hoping that everything would turn out for the characters. This entry was posted in Books and tagged award winners, Cybils, Prinz, teen fiction. Bookmark the permalink.